Slot fans are invited to say aloha to the beauty of the USA’s most tropical state by playing Hawaiian Treasure, a five reel, three row and 25 payline slot with a theoretical return to player percentage of 93.995%. 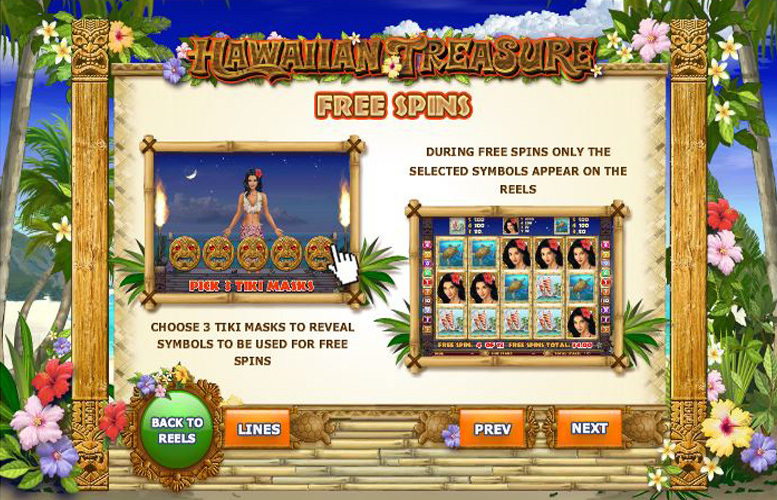 Showing off plenty of beautiful images of people and things associated with Hawaii, the slot also includes an innovative multi-purpose wild scatter symbol and gives players the chance to trigger potentially very beneficial free spins. 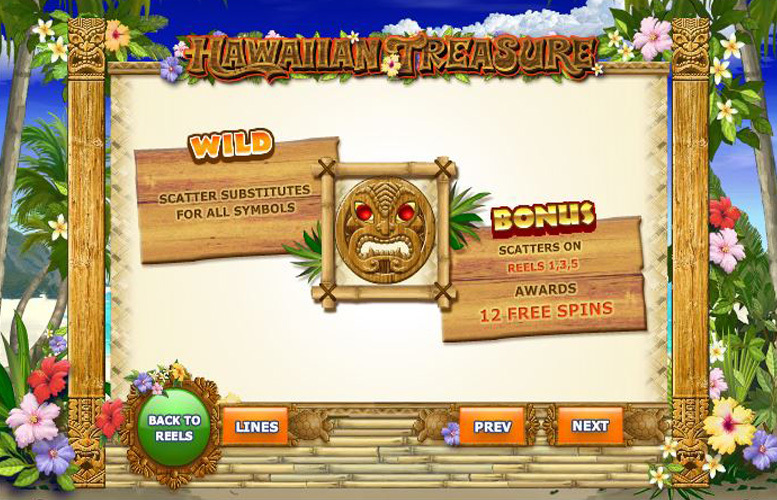 Hawaiian Treasure’s almost unique wild scatter symbol adds both extra interest and winning potential to the slot’s gameplay. A broad range of staking options are provided for, with bets of between 25p and £625 per spin possible. Free spins on enhanced reels that only contained three types of symbol make it much easier for players to achieve valuable combinations. A top payline jackpot of £25,000 is a little disappointing, especially compared with the payouts offered by other similar slots. The lack of a bonus feature or sidegame means that the slot isn’t as immersive or fun as it might be. An overall return to player percentage of 93.995% is a little on the low side. A Hawaiian princess would be a welcome sight anyway, but is even easier on the eyes when she is the image depicted by Hawaiian Treasure’s most valuable symbol. 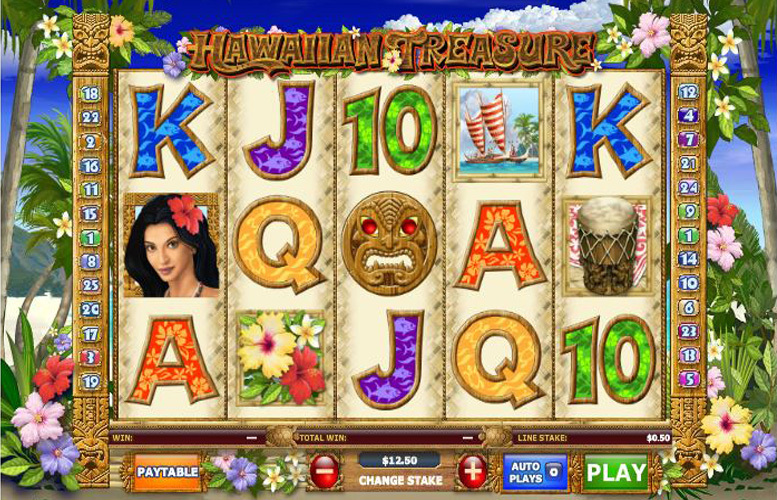 The game’s top jackpot, in fact, results when five of the Hawaiian Princess symbols align along an active payline. That five Hawaiian Princess symbol combination triggers a payout worth 1,000 times the player’s chosen line bet. Given that the highest line bet possible in the slot is £25, the top Hawaiian Treasure jackpot is therefore worth £25,000. 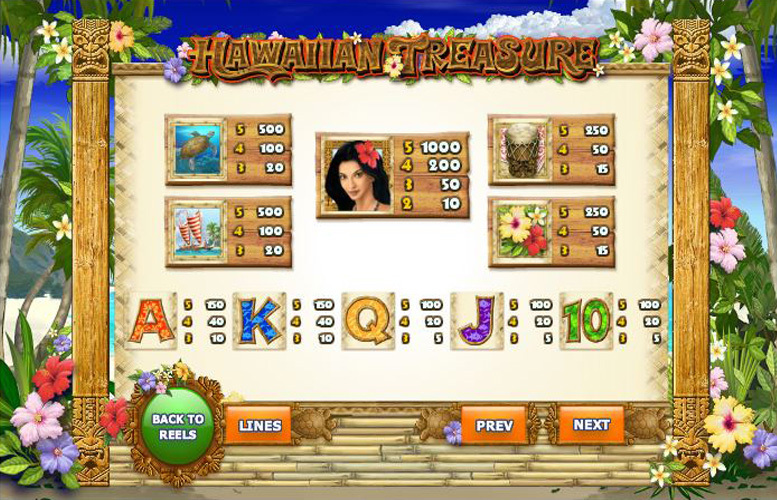 In order to add a little bit extra to gameplay and to boost the winning potential of the slot, Hawaiian Treasure includes a couple of additional game features. Those are namely the Tiki Mask Wild Scatter symbol and the special free spins which the symbol can trigger. Playing two diverse roles, the Hawaiian Treasure Tiki Mask Wild Scatter symbol appears only on reels one, three and five. After any spin, when the symbol appears anywhere it can stand for any other symbol in making up the most valuable possible payline combinations. What’s more, if the symbol appear on each of its three reels at the same time it triggers 12 special free spins. Once those 12 free spins have been triggered, players are invited to select three Tiki Masks from a choice of five. Each mask selected will reveal a symbol and only the three symbols revealed will feature on the free spin reels. That, therefore, makes it much more likely for winning combinations to result from the spins. All themed around the islands of Hawaii, the symbols on the Hawaiian Treasure reels either depict tropically decorated letters of the alphabet or images of people, animals or things from the islands. It is the latter of those two types of symbol which are the more valuable in terms of the payline combinations they create. Behind the Hawaiian Princess symbol, which we have already discussed, it is the turtle, boats, drum and flowers symbols which are the most welcome sights on the reels. A five symbol combination of the turtle or the boats symbols results in a jackpot worth 500 times the line bet. Five of the drum or the flowers symbols along a payline, meanwhile, triggers a payout worth 250 times the bet per line. Unlike the vast majority of other slots, Hawaiian Treasure doesn’t actually allow players to alter the number of active paylines for each spin. In order to change their stake per spin, therefore, players can only alter the amount they wish to bet per payline. Fortunately, there are a vast array of different line bet options provided by Hawaiian Treasure, between the minimum of 1p and the maximum of £25. As the slot has 25 total paylines, that means that the minimum overall bet per spin stands at 25p and the maximum is £625. Whisking players off to a tropical paradise – virtually at least – Hawaiian Treasure is undoubtedly visually attractive and also boasts a number of other notable good points. The Tiki Mask Wild Scatter symbol, for instance, is a fun innovation that helps to improve players’ chances of winning in two diverse ways. One of those ways is by triggering enhanced free spins, which themselves also help to add some extra interest to the slot’s gameplay. On the flipside, however, there are also a few notable downsides to be found with the Hawaiian Treasure slot. Payline jackpots, for example, are a little stingy when compared to other similar slots and an overall theoretical return to player percentage of 93.995% is also on the low side. This game has a rating of 4 / 5 with 623 total reviews by the users.